"The Diocese of St. Augustine has investigated and cannot authenticate, endorse, nor approve in any way the factual or theological contents of Father Jose Maniyangat's personal life after death story." At the age of fourteen, I entered St. Mary's minor seminary in Thiruvalla to begin my studies for the priesthood. Four years later I went to St. Joseph's Pontifical Major Seminary in Alwaye, Kerala to continue my priestly formation. After completing the seven years of Philosophy and Theology I was ordained a priest on January 1, 1975 to serve as a missionary at the Diocese of Thiruvalla. In 1978 while teaching at the St. Thomas minor seminary in Bathery, I became an active member of the Charismatic Renewal movement and began conducting charismatic retreats and conferences in Kerala. On Sunday April 14, 1985, the Feast of the Divine Mercy, I was going to celebrate Mass at a mission church in the north part of Kerala, and I had a fatal accident. I was riding a motorcycle when I was hit head-on by a jeep driven by a man who was intoxicated after a Hindu festival. I was rushed to a hospital about 35 miles away. On the way my soul came out from my body and I experienced death. Immediately I met my Guardian angel. I saw my body and the people who were carrying me to the hospital. I heard them crying and praying for me. At this time my angel told me: "I am going to take you to Heaven, the Lord wants to meet you and talk with you". He also said that on the way he wanted to show me hell and purgatory. First, the angel escorted me to hell. It was an awful sight! I saw Satan and the devils, an unquenchable fire of about 2,000 Fahrenheit degrees, worms crawling, people screaming and fighting, others being tortured by demons. The angel told me that all these sufferings were due to unrepented mortal sins. Then, I understood that there are seven degrees of suffering or levels according to the number and kinds of mortal sins committed in their earthly lives. The souls looked very ugly, cruel and horrific. It was a fearful experience. I saw people whom I knew but I am not allowed to reveal their identities. The sins that convicted them were mainly abortion, homosexuality, euthanasia, hatefulness, unforgiveness and sacrilege. The angel told me that if they had repented they would have avoided hell and gone instead to purgatory. I also understood that some people who repent from these sins might be purified on earth through their sufferings. This way they can avoid purgatory and go straight to heaven. After the visit to hell, my Guardian angel escorted me to Purgatory. Here too, there are seven degrees of suffering and unquenchable fire. But it is far less intense than hell and there was neither quarreling nor fighting. The main suffering of these souls is their separation from God. Some of those who are in Purgatory committed numerous mortal sins; but they were reconciled with God before their death. Even though these souls are suffering, they enjoy peace and the knowledge that one day they will see God face to face. I had a chance to communicate with the souls in Purgatory. They asked me to pray for them and to tell the people to pray for them as well, so they can go to heaven quickly. When we pray for these souls we will receive their gratitude through their prayers and once they enter heaven their prayers become even more meritorious. Next, my angel escorted me to heaven passing through a big dazzling white tunnel. I never experienced this much peace and joy in my life. Then immediately the heaven opened up and I heard the most delightful music, which I never heard before. The angels were singing and praising God. I saw all the saints, especially the Blessed Mother and St. Joseph, and many dedicated holy Bishops and Priests who were shining like stars. And when I appeared before the Lord, Jesus told me: "I want you to go back to the world. In your second life you will be an instrument of peace and healing to my people. You will walk in a foreign land and you will speak in a foreign tongue. Everything is possible for you with my grace". After these words, the Blessed Mother told me: "Do whatever He tells you. I will help you in your ministries". Words can not express the beauty of heaven. There we find so much peace and happiness, which exceed a million times our imagination. Our Lord is far more beautiful than any image can convey. His face is radiant and luminous and more beautiful than a thousand rising suns. The pictures we see in the world are only a shadow of His magnificence. The Blessed Mother was next to Jesus; she was so beautiful and radiant. None of the images we see in this world can compare with her real beauty. Heaven is our real home, we are all created to reach heaven and enjoy God forever. Then, I came back to the world with my angel. While my body was at the hospital, the doctor completed all examinations and I was pronounced dead. The cause of death was bleeding. My family was notified and since they were far away, the hospital staff decided to move my dead body to the morgue. Because the hospital did not have air conditioners they were concerned that the body would decompose quickly. As they were moving my dead body to the morgue, my soul came back to the body. I felt an excruciating pain because of so many wounds and broken bones. I began to scream and then the people became frightened and ran away screaming. One of them approached the doctor and said: "the dead body is screaming". The doctor came to examine the body and found that I was alive. So he said: "Father is alive, it is a miracle, take him back to the hospital". Now, back at the hospital, they gave me blood transfusions and I was taken to surgery to repair the broken bones. They worked on my lower jaw, ribs, pelvic bone, wrists, and right leg. After two months, I was released from the hospital, but my orthopedic doctor said that I would never walk again. I then said to him: " the Lord who gave me my life back and sent me back to the world will heal me". Once at home we were all praying for a miracle. Still after a month and with the casts removed I was not able to move. But one day while praying I felt an extraordinary pain in my pelvic area. After a short while the pain disappeared completely and I heard a voice saying: "You are healed. Get up and walk". I felt the peace and healing power on my body. I immediately got up and walked. I praised and thanked God for the miracle. I reached my doctor with the news of my healing and he was amazed. He said: "your God is the true God. I must follow your God". The doctor was Hindu and he asked me to teach him about our Church. After studying the faith, I baptized him and he became Catholic. Following the message from my Guardian angel, I came to the United States on November 10, 1986 as a missionary Priest. First, I worked in the Diocese of Boise, Idaho from 1987 to 1989 and then became the Director of Prison Ministry in the Diocese of Orlando, Florida from 1989 to 1992. In 1992, I came to the Diocese of St. Augustine where I was first assigned to St. Matthew's Parish in Jacksonville for two years. I was then appointed Parochial Vicar of Assumption Church from 1994 to 1999. In 1997 I was incardinated as a permanent member of the Diocese. From June 1999 to June 2011, I was Pastor of St. Mary's Mother of Mercy Catholic Church in Macclenny, Florida. I also served as the Catholic Chaplain for Florida State Prison in Starke, Union Correctional Institution in Raiford and Northeast Florida State Hospital in Macclenny. 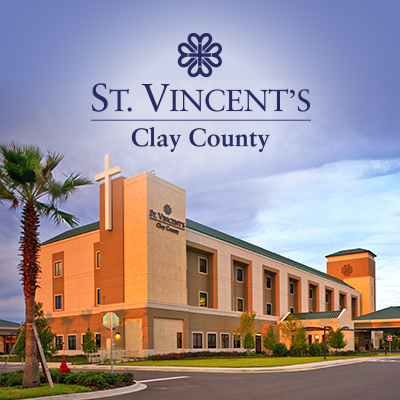 On July 1, 2011 I was assigned to St. Catherine of Siena Catholic Church in Orange Park, Florida. 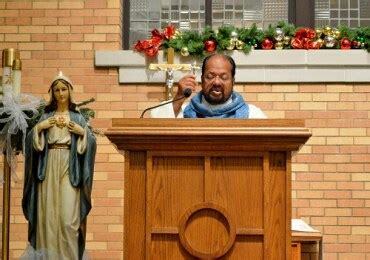 I am also the Diocesan Spiritual Director of the Legion of Mary. On the first Saturday of each month I conduct a Eucharistic and charismatic-healing ministry at my current parish St. Catherine of Siena Catholic Church in Orange Park, Florida. People come from all over the diocese, many parts of Florida and even from out of the state. I have been invited to conduct the healing ministry in other major cities of the United States including: New York, Philadelphia, Washington DC, San Jose, Dallas, Chicago, Birmingham, Denver, Boise, Idaho Falls, Hawaii, Miami, Ft. Lauderdale, Poolsville; and many other countries: Ireland, Spain, Czech Republic, India, France, Portugal, Yugoslavia, Italy, Canada, Mexico, Cayman Island, and Ontario. Through this Eucharistic-healing ministry I have seen many people healed physically, spiritually, mentally and emotionally. People with various illnesses such as: cancer, AIDs, arthritis, heart conditions, eye problems, emphysema, asthma, back pains, bad hearing and many others have been healed completely. In addition, several times during the year I conduct a special healing service for the healing of the family tree, in which the effects from ancestral sins are blocked and the person receives complete healing. Scripture says that the effects from family sins can linger around for three to five generations (Exodus Chapter 34 verse 7). So, in many cases we need generational healing. Doctors and medicines do not help to heal certain sicknesses caused by our family tree. 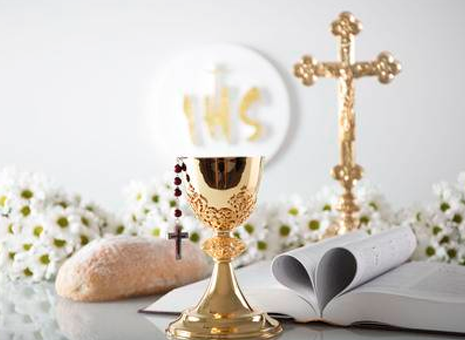 During the Healing ministry, many people rest in the spirit before the Blessed Sacrament and some experience renewal of the soul and healing of the body.